Why Pristine Leaf Organic Matcha? At Pristine Leaf, we understand your busy urban lifestyle, and for our tea lover seeking to recharge, or the yogi looking for a natural refreshment before hitting the studio. We bring to you from family own tea gardens in deep mountains of China, with love, Matcha in Ceremonial & your favorite Flavors, in our single serve tea packet. Our Matcha organically shade grown, handpicked, traditionally stone grounded and packed with freshness, subtle aroma and natural sweetness. It is easy to prepare instantly, and designed for your convenience to carry anywhere you go. Contains 3 single serves of Ceremonial, Vanilla, Strawberry, Blueberries, Mango, & Peach Matcha. 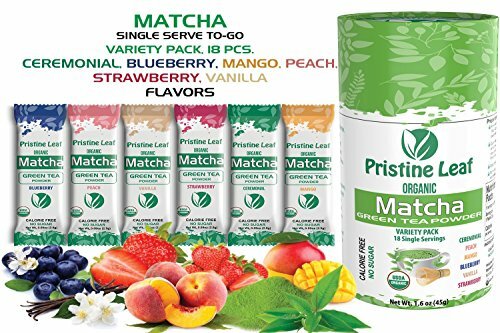 Pristine Leaf Matcha Single Servings are Organic, Non GMO, All Natural Flavors, No Artificial Ingredients, Calorie Free, Sugar Free, Gluten Free, Dairy Free, Soy Free, No Colorants, No Fillers, Non-Toxic, Radiation Free. We Love Our Matcha, Hope You'll Love it too! Nutrition Facts: Serving per container: 1, Serving Size: 1 stick (2.5g), Amount per serving (%DV*): Calories 0, Total Fat 0g (0%), Sodium 0mg (0%), Total Carbohydrates 1g (<1%), Dietary Fiber 1g (4%), Protein 1g (2%), Vitamin A (10%), Vitamin C (6%), Calcium (2%), Iron (2%). Satisfaction Guaranteed: If you are not 100% satisfied with your purchase for any reason, just email us and we'll refund your order in full, no questions asked. Storage Instructions: Store in Cool & Dry Place. CERTIFIED USDA ORGANIC MATCHA, it is Non-GMO, All Natural Flavors plus Calorie Free, Sugar Free, Gluten Free, Dairy Free, Soy Free, No Colorants, No Fillers, No Artificial Ingredients. NATURE'S SUPERFOOD: An alternative to Coffee, Soda & aerated drinks. Natural long lasting energy. ENJOY Your Favorite Classic Ceremonial Matcha, Strawberry, Blueberry, Mango, Peach, Vanilla Taste in Instant Organic Matcha Green Tea. Great addition to your smoothies, shakes or any of favorite drink. If you have any questions about this product by Pristine Leaf, contact us by completing and submitting the form below. If you are looking for a specif part number, please include it with your message.